Plate tectonics is the model or theory that has been used for the past 60 years to understand Earth’s development and structure — more specifically the origins of continents and oceans, of folded rocks and mountain ranges, of earthquakes and volcanoes, and of continental drift. It is explained in some detail in Chapter 10, but is introduced here because it includes concepts that are important to many of the topics covered in the next few chapters. 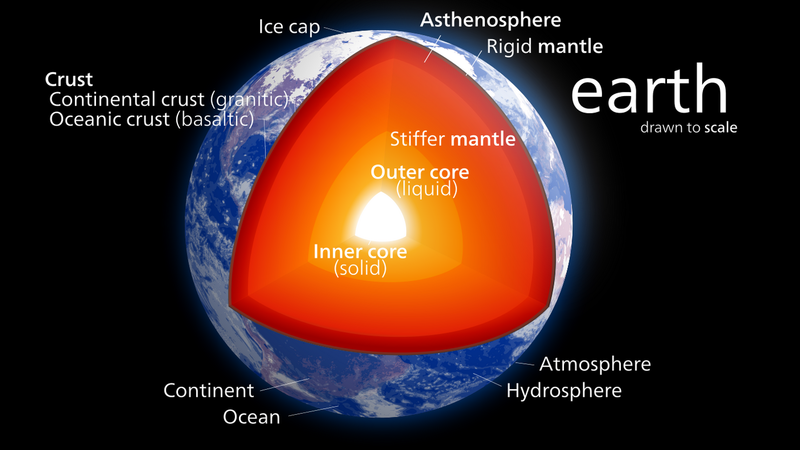 An important property of Earth (and other planets) is that the temperature increases with depth, from close to 0°C at the surface to about 7000°C at the centre of the core. In the crust, the rate of temperature increase is about 30°C/km. This is known as the geothermal gradient. 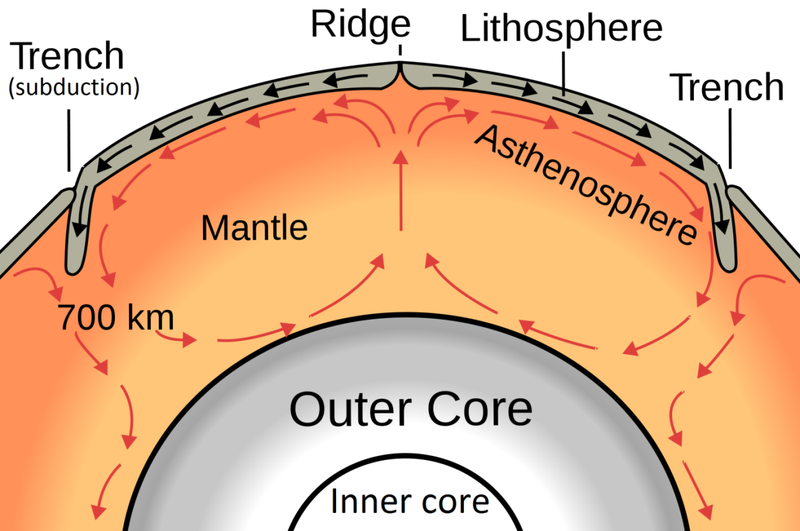 Heat is continuously flowing outward from Earth’s interior, and the transfer of heat from the core to the mantle causes convection in the mantle (Figure 1.7). This convection is the primary driving force for the movement of tectonic plates. At places where convection currents in the mantle are moving upward, new lithosphere forms (at ocean ridges), and the plates move apart (diverge). Where two plates are converging (and the convective flow is downward), one plate will be subducted (pushed down) into the mantle beneath the other. Many of Earth’s major earthquakes and volcanoes are associated with convergent boundaries. Earth’s major tectonic plates and the directions and rates at which they are diverging at sea-floor ridges, are shown in Figure 1.8. Using either a map of the tectonic plates from the Internet or Figure 1.8, determine which tectonic plate you are on right now, approximately how fast it is moving, and in what direction. How far has that plate moved relative to Earth’s core since you were born? 1.5 Fundamentals of Plate Tectonics by Steven Earle is licensed under a Creative Commons Attribution 4.0 International License, except where otherwise noted.